London- reminds me alittle bit of home! After arriving in Vitoria Gasteiz a week ago, it gave me a chance to settle back in and get some quality sessions in post travel. This year for me has been the hardest to say goodbye to home and fit back into Vitoria after spending a year at home last year after my surgery. After the Gold Coast, I started second guessing myself a lot about my place in the sport. Having a good month worth of training in Wollongong and a few small races to get some confidence back into my training and racing has helped me a lot. 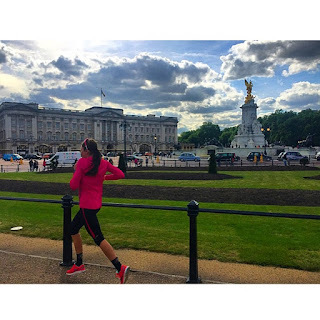 Pre race was good to see bits and pieces of London like Buckingham Palace and ride on the course in Hyde park where we got stopped by a horses practicing for the Queen’s birthday long weekend. Last time I was in London was for World Championships in 2013. I was pretty disappointed with my result, so I was excited to come back and give it a crack.